This is a view of Victoria Bridge over the River Irwell, taken from Trinity Bridge on the border of Manchester and Salford. This to me is a pretty epic shot, not in terms of view, but in terms of colour and reflection. The shot has been triple filtered through Instagram. It's a mix of lo-fi and hefe. Most Sundays I go to Manchester to have a wander around the shops and have coffee either in Starbucks St Ann's Square or Caffe Nero on Deansgate. I park on the Salford side of the River Irwell near the Lowry Hotel as there is free parking. As a result I cross over Trinity Bridge nearly every week and always end up taking a photo or ten. This place has become a muse to me as there seems to be lots of photographic opportunities here. 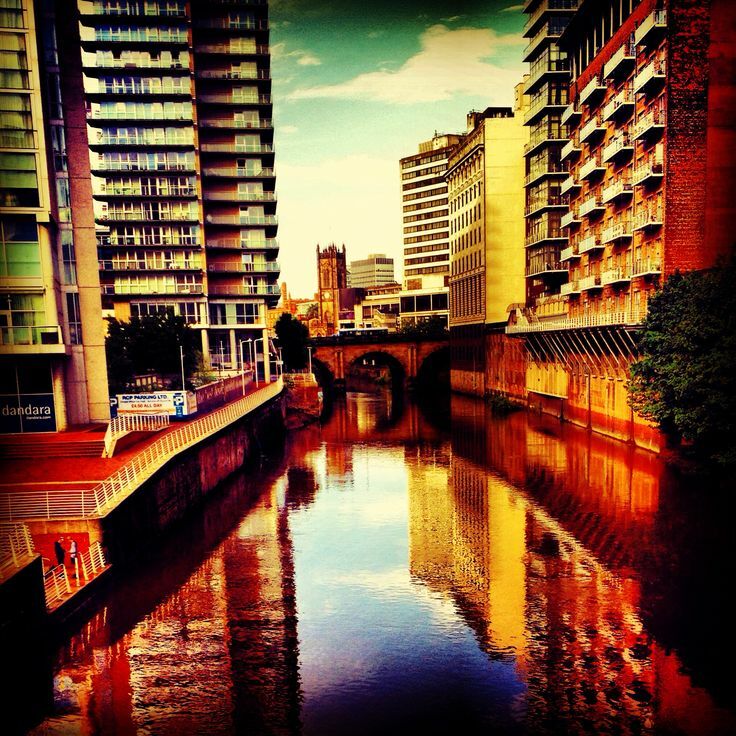 The Sunday I took this I noticed there was a really good reflection on the River Irwell of the sky and surrounding buildings so I took a shot. The triple filtering was an accident, a happy one at that. I forgot to hash tag my second shot so I thought 'What the hell' and filtered it again. What I've noticed with Instagram, when you get to the triple filter stage you tend to get a painterly effect and the colours really intensify. I really love strong colour in photos, even if it's used sparingly. My favourite living artist is David Hockney and he has an amazing use of colour. In his latest works of the East Yorkshire countryside there is a colour intensity which is thrilling. He seems to see colours that most of us don't notice. Using colour intensity effects like lo-fi and hefe brings out those hints of colours. The yellow, oranges, greens, blues and indigo just zing out of this picture. Whilst in reality this view can be considered a little pedestrian, I think these filters really transform the view into something else. Whilst I think the purpose of photography is to capture a moment of reality in time, photography has the purpose to transform something ordinary into something special. I hope I did this here.